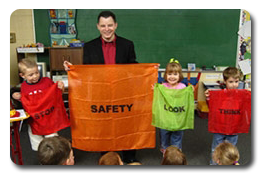 A magic show geared toward elementary aged children teaching them about electrical safety. This fun and magical show entertains youth while also being educational. Best of all, this program is offered to area schools at no charge. 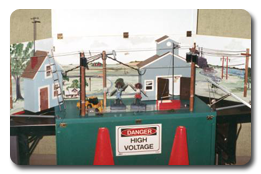 This four foot display models a small town and features low voltage distribution lines. Lightn’ Lizzy and Neon Leon live in this town and aid our personnel in demonstrating the need to be safe around electricity. Lizzy and Leon light up when they are unsafe around electricity. This program is put on by NAEC personnel and is geared toward elementary aged children. 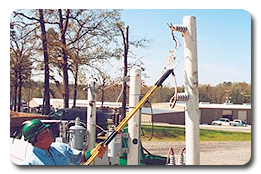 For the past four years, North Arkansas Electric Cooperative has traveled across our service area with a trailer equipped with a model electrical distribution system, including poles, wires and a transformer, among other equipment. The demonstrations are performed with live electrical power, about 7,000 volts, to educate the public about proper safety precautions around electrical equipment. This demonstration is perfect for teenagers and adults alike. To schedule an educational program, contact Chris Hickman at (870) 508-5833.